GoPro on Monday announced its new 2014 lineup of wearable action cameras, including the flagship Hero4 Black, which is capable of recording not only 4K-resolution video at 30 frames per second, but also high-definition 1080p footage at 120 frames per second. 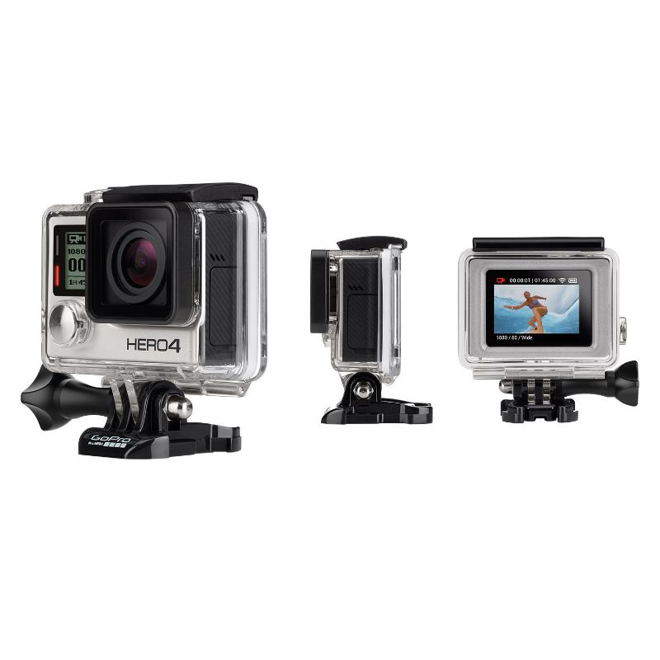 Priced at $499.99, the Hero4 Black is the most professional-grade model in GoPro's new product lineup. It also features a redesigned audio system that captures high-fidelity audio at two times the dynamic range of previous models. The Hero4 black also has improved image quality and low-light performance, as well as highlight moment tagging and an improved user interface. Capture modes also include 2.7K video at 50 frames per second, and a new "4K Superview" mode with ultra-wide field of view at a cinematic 24 frames per second. Like previous models, including the GoPro Hero3+ Black Edition that AppleInsider tested last year, the new GoPro Hero4 will include Wi-Fi connectivity to allow it to be controlled and for content to be viewed from a connected iPhone or iPad. This year's model also adds a Bluetooth radio for even more capabilities, and connection speeds and power management are said to have been improved. "For the past twelve years, our passion has been to make it easy for people to self-capture jaw dropping, professional quality footage of themselves engaged in their favorite activities," said GoPro Founder and CEO, Nicholas Woodman. "That passion led us to embark on our most ambitious design and engineering effort ever, and the result is nothing short of the ultimate GoPro —the Hero4 Black. We can't wait to see what the world captures with it." Joining the Hero4 Black will be the Hero4 Silver, priced at $399.99. The $100 price cut reduces 4K video recording to 15 frames per second and also eliminates the 4K Superview wide field-of-vision capabilities. The Silver model also records 2.7K video at 30 frames per second, and 1080p at 60 frames per second, but still boasts built-in Wi-Fi and Bluetooth. It also comes with a built-in touchscreen display, which the Hero 4 Black lacks. Both new Hero4 cameras are set to become available on Oct. 5. The GoPro app for iPhone will also be updated to support Hero4 and new features like "HiLight Tagging" while recording, and searching for tags during playback. 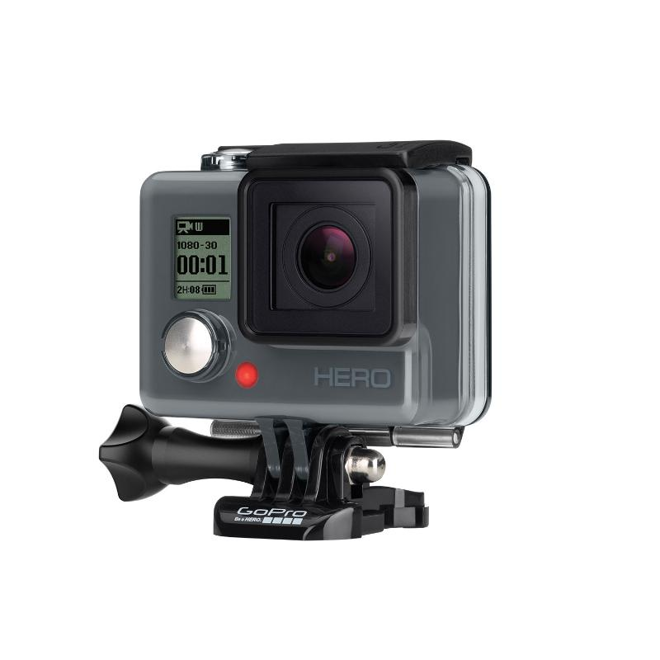 Also joining the GoPro lineup is the Hero, a budget-priced sports camera that will be available for $129.99. It lacks built-in Wi-Fi for iPhone connectivity, but captures high-resolution 1080p video at 30 frames per second with its wide-angle lens, and 720p video can be recorded at 60 frames per second. 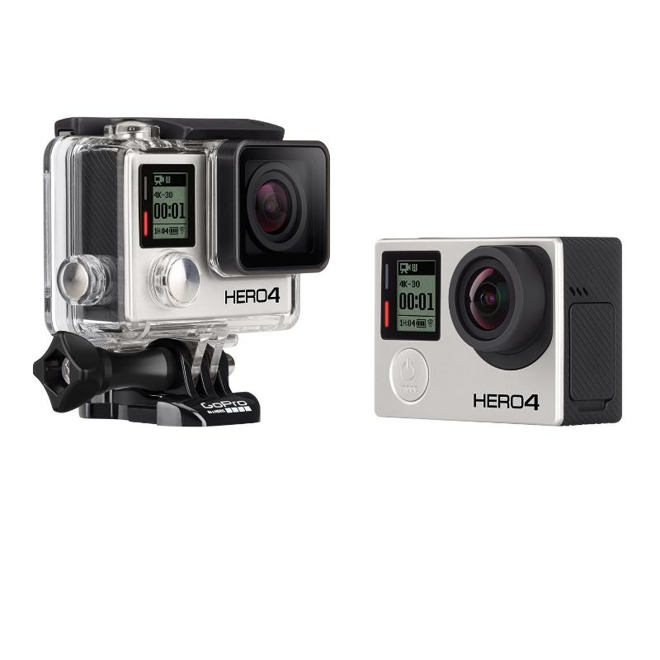 Finishing out the GoPro lineup are the $299.99 Hero3+ Silver, which records 1080p at 60 frames per second, and the $199.99 Hero3 White, which captures 1080p at 30 frames per second. Both cameras do feature built-in Wi-Fi for iOS connectivity. Smart remote: Control your GoPro from up to 600 feet away with this wearable and waterproof remote. Also allows users to mark moments with a "HiLight Tag" button. The Handler: A compact floating handgrip. New BacPac accessories: A new Battery BacPac provides almost twice the power over the built-in battery alone. And a new LCD BacPac provides improved touch and swipe performance when used with the Hero4 Black.